This story was updated April 11, 2018, at 11:59 p.m. with more information. A senior at the University of Tennessee at Chattanooga who posted what she said was an unusual graduation photo on social media has sparked a national debate about handguns and where and how they should be used and displayed. 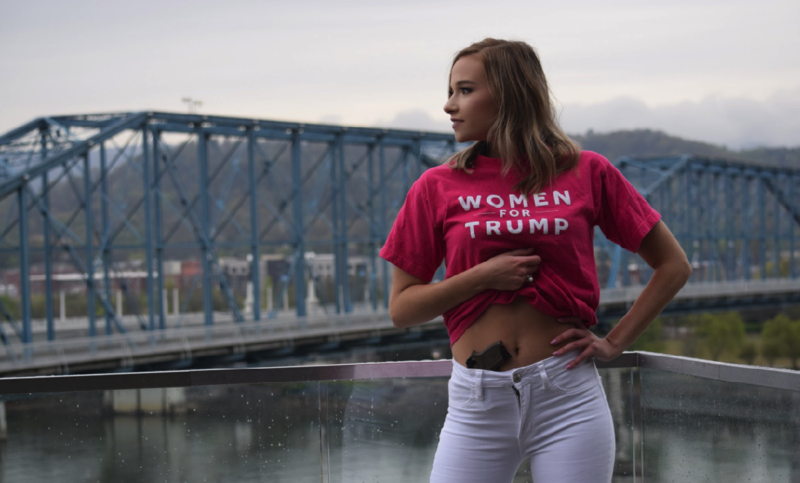 Brenna Spencer, a 22-year-old Cincinnati native who is a communications major at UTC, told Fox News in a national broadcast Wednesday that her display of a handgun tucked beneath her "Women for Trump" T-shirt was a way for her to voice her support for both the president and Second Amendment rights. Spencer posted the photo on her Twitter account with the caption, "I don't take normal college graduation photos ... "
Posted Saturday, the tweet had 86,000 likes as of late Wednesday. Spencer did not return messages on Twitter, Facebook or left on a "contact us" section of her website. UTC's graduation is next month. She said on "Fox & Friends" she doesn't know what she will do after college, though the photo "has opened a lot of doors for me." A number of conservative commentators have promoted the photo, including columnist Ben Shapiro and activist Charlie Kirk. A story about the picture was picked up by Breitbart and Barstool Sports. The latter outlet, whose post Spencer promoted on Twitter, called her a "SMOKE." After about nine paragraphs, the article ends with the line, "For your consideration ..." and a series of pictures of Spencer in a bikini. Spencer took the gun photo on the Hunter Museum of American Art's 24-hour terrace, which overlooks the Tennessee River. The museum is a gun-free zone, director of marketing and communications Cara McGowan said. So is the terrace. On Wednesday afternoon, Turning Point USA Regional Manager Alana Mastrangelo posted a picture of herself with a gun holstered in Cleveland. Turning Point USA describes itself as the "community organizers of the right." In the post, Mastrangelo wrote, "ABC News called the police on my friend, Brenna Spencer (probably hoping to get a better story)." Mastrangelo added, "We will NOT allow for Leftist intimidation tactics." Her page has more than 100,000 Twitter followers, and this post was retweeted more than 5,000 times, including by Spencer. 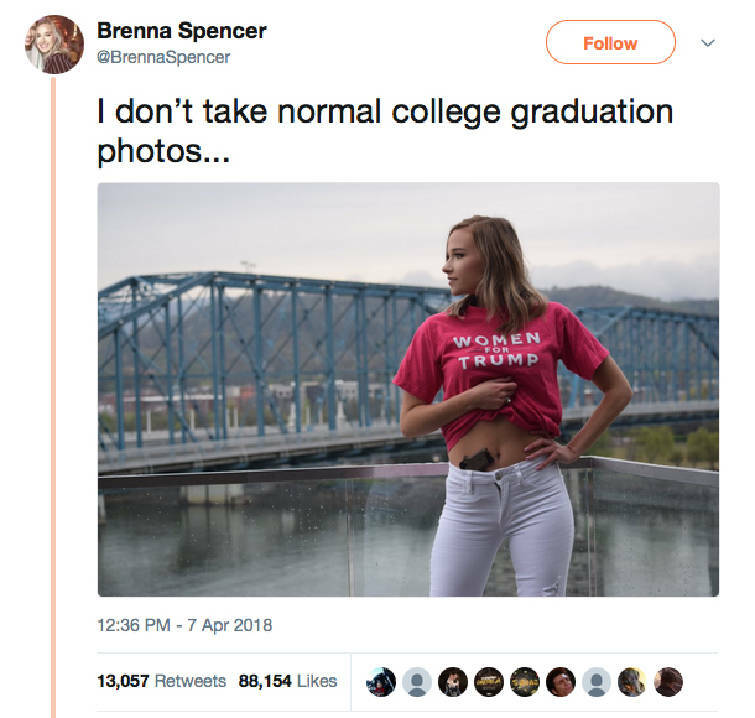 Brenna Spencer, a senior at the University of Tennessee at Chattanooga, posted what she said was an unusual graduation photo on social media. The photo has since sparked a national debate about handguns as well as where and how they should be used and displayed. Mastrangelo later told the Times Free Press she did not know the nature of the ABC News reporter's call to the police, or whether the reporter was trying to get Spencer in trouble. But she believed the reporter was "looking for a better story." Chattanooga Police Department spokeswoman Elisa Myzal said an ABC News reporter contacted the department for comment. "That is all," she said. Myzal said nobody filed an incident report related to the photo. If owners want to keep their properties gun-free, they are allowed to ask gun holders to leave the weapons behind. If the gun holders say no, the property owner can file trespassing or unlawful possession of a weapon charges with the police. On Wednesday, Spencer told "Fox & Friends" in a live interview from Chattanooga that she wanted her graduation photos "to be personal and show who I am." "Being very passionate about conservative politics and the Second Amendment, I decided that was what I wanted to do," Spencer said. "Sexual assault has grabbed a lot of attention in recent years, especially on college campuses, so I think it is important for women to know that they are their own first line of defense. The Second Amendment has been under attack, especially on college campuses. Not only do they try to restrict our right to carry on college campuses, they also are trying to up the age to carry to 21. But I think it is important to be able to protect yourself, and your rights don't stop at a college campus." UTC, like other Tennessee college campuses, does not allow students to carry guns on its campus. I don’t agree w her political views but let’s not bash her appearance. As women we should be empowering each other not bringing each other down ????? If people don't exercise their rights publicly they will lose them. Americans need to take a lesson from this - in the UK we had the right to bear arms for 300 years but when we failed to exercise that right publicly we lost it. I don’t agree with just supporting women blindly just because they’re women. Female Trump supporters couldn’t care less about women’s rights.